The first step to getting organized for the New Year is a planner or calendar that’s too cool not to use. Whether you want to map out the entire year, take it a month or week at a time, or just need a daily reminder of the date (still writing 2014? ), there are some fabulous and unique DIY planners and calendars out there. 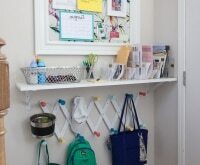 Better still, these nifty organizers double as wall and desk decor and ensure that your year gets off to a beautifully organized and creative start. 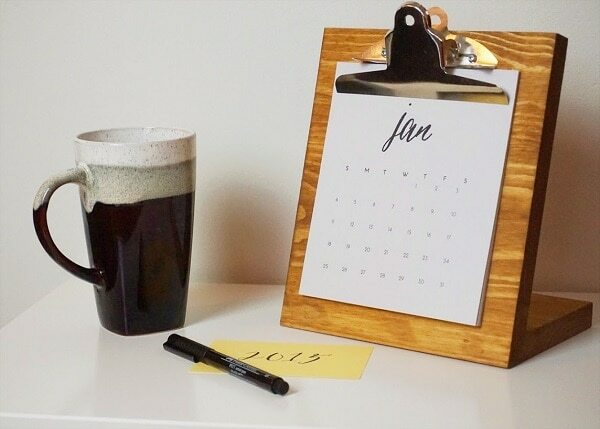 The materials for this practical and easy-to-make calendar will cost you about $5. All you need is one large tile (the one shown is a 12-inch square) to keep track of every month of the year ahead. Use a Sharpie to draw a grid, seven squares by five squares, with slots at the top of each row for days of the week. Each month, redecorate using dry erase markers to fill in the numbers, name of the month, and whatever colors or motifs you like. If you’d rather see the whole year at a glance, you could use twelve smaller tiles and mount them on the wall. Get a designer look at a fraction of the price. 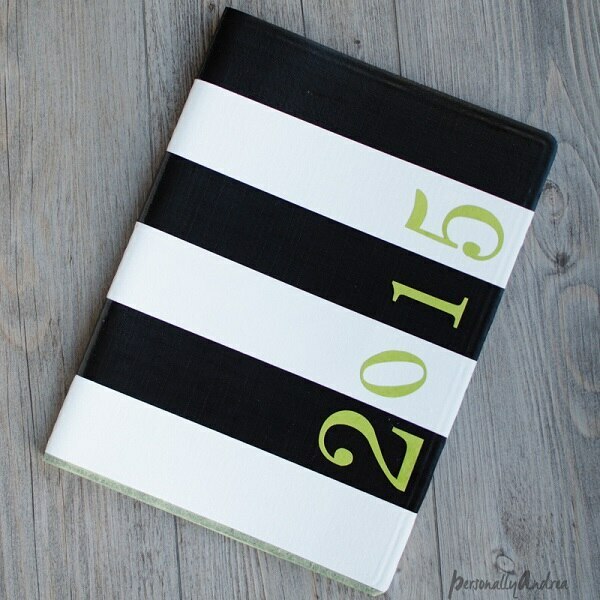 Create this Kate Spade-inspired planner by decorating a plain planner with duct tape and die cut letters. 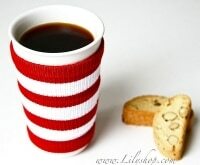 Plan for the year ahead using last year’s memories. 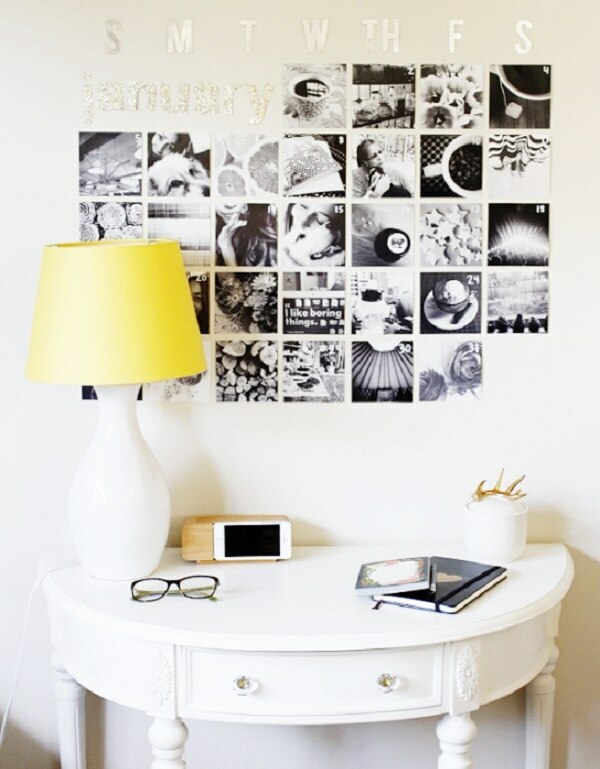 Each day is marked by a 4 x 4 photo print, numbered with a white or black paint pen. 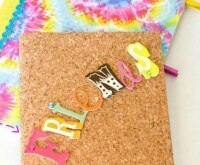 Mark the month and days using chipboard letters. It may be 2015, but chalkboard is still in style. 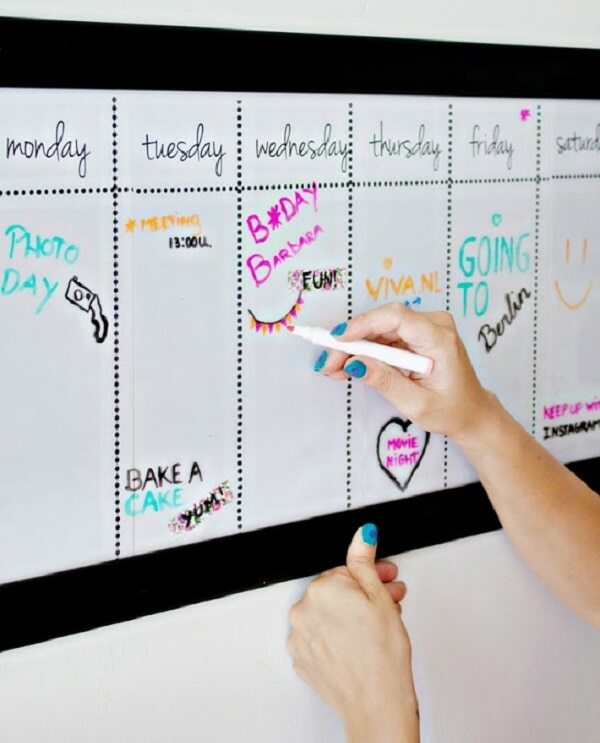 Use chalkboard paint to create a modern wall calendar, then fill in the days using chalk, or mark with stickies. 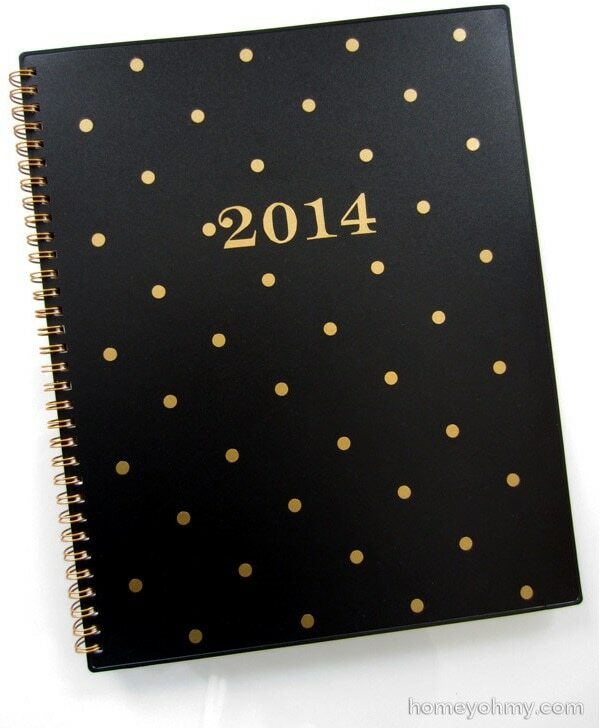 Jazz up a plane black planner with gold cut-out dots and numbers (of course you’ll have to change that 4 to a 5). Gold goes with everything, and black and white is always chic! 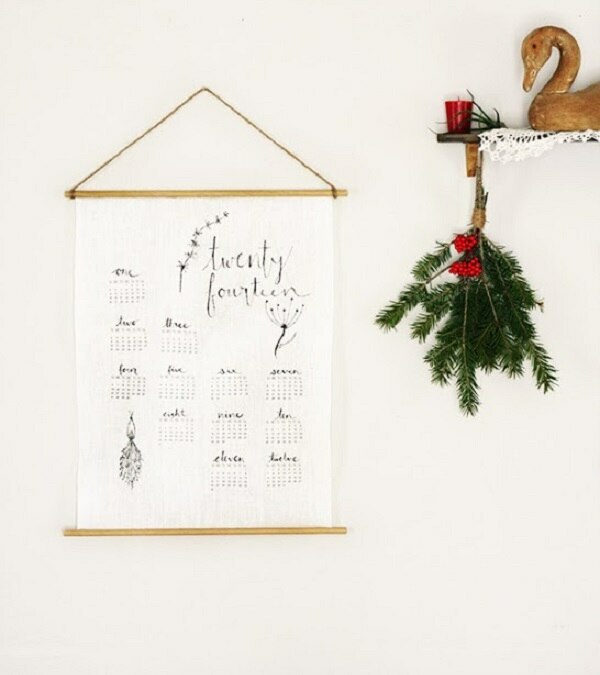 Make an updated version of this elegant scroll-like hanging calendar. It’s made using linen, wooden rods, and iron-on transfer. 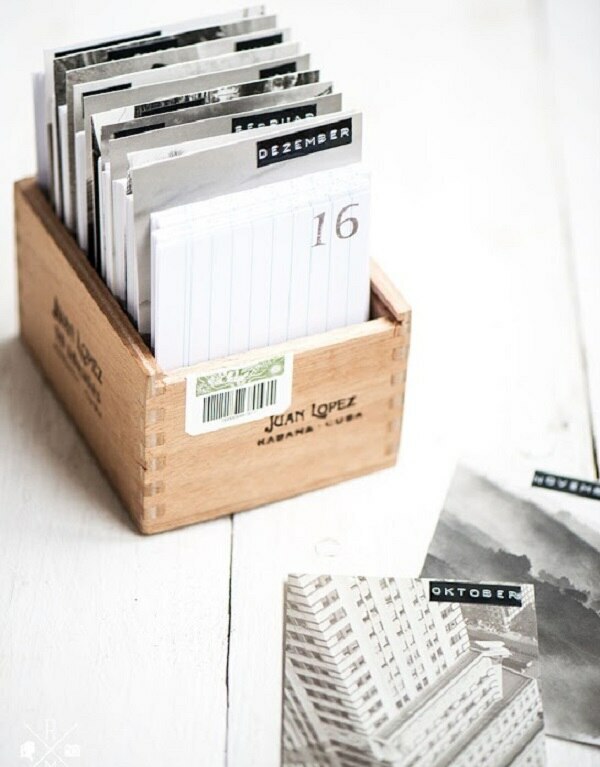 This lovely desk calendar makes for stylish desk decor. To replicate, make your own clipboard from scratch (you could also purchase one) and print out monthly calendars on cardstock. Part calendar and part art, the plywood base of this calendar is hung from a leather strap. 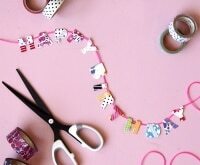 Attach the free printable monthly calendars using washi tape so you can easily switch them out. 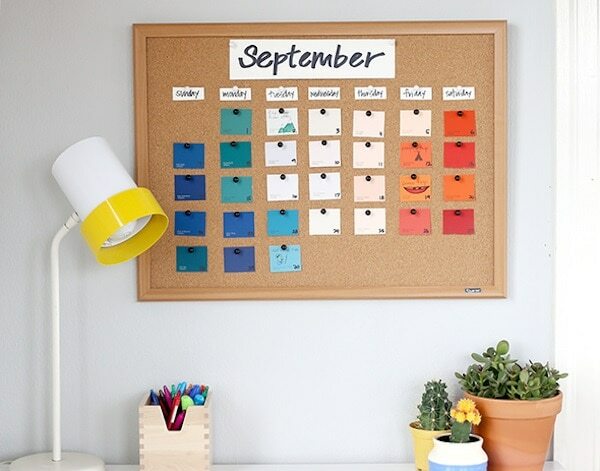 Make a pretty and colorful calendar by cutting squares out of of paint chips and numbering them with Sharpie. Stock up on (free) samples at your local hardware store so you can create a different color theme each month. 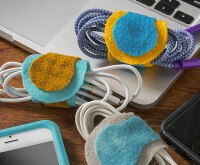 What better way to get organized than with the ever-useful Sticky Note? 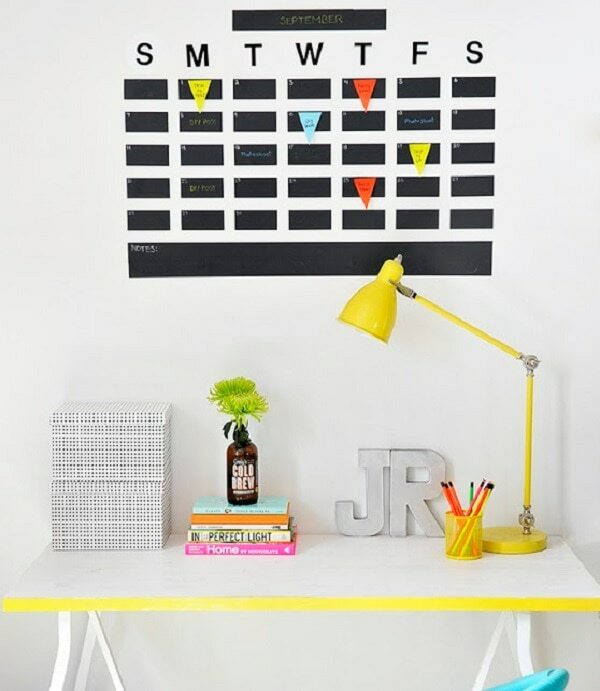 This bright and cheery wall calendar is simply stuck on the wall, with the month written on Washi tape. 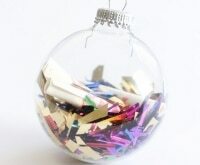 Keep track of the year ahead with an upcycled masterpiece. 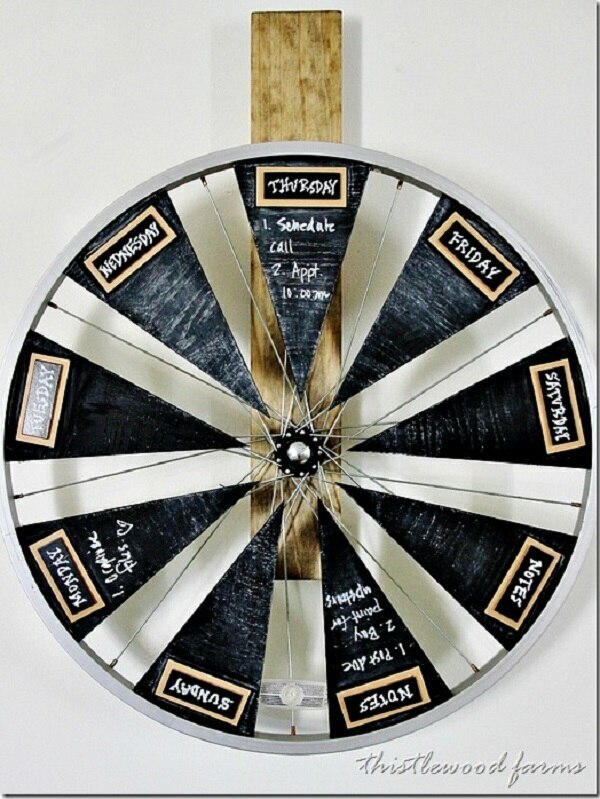 Create a unique spinning calendar out of an old bicycle wheel and plywood triangles coated with chalkboard paint. It may take some time, but the weekly format can be reused for years to come. Magic happens when metallic pens meet plane black notebooks. 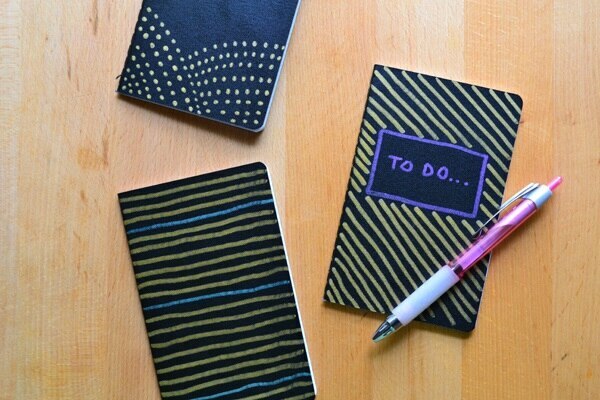 Some basic doodling will make your planner or To Do notebook a pretty accessory. 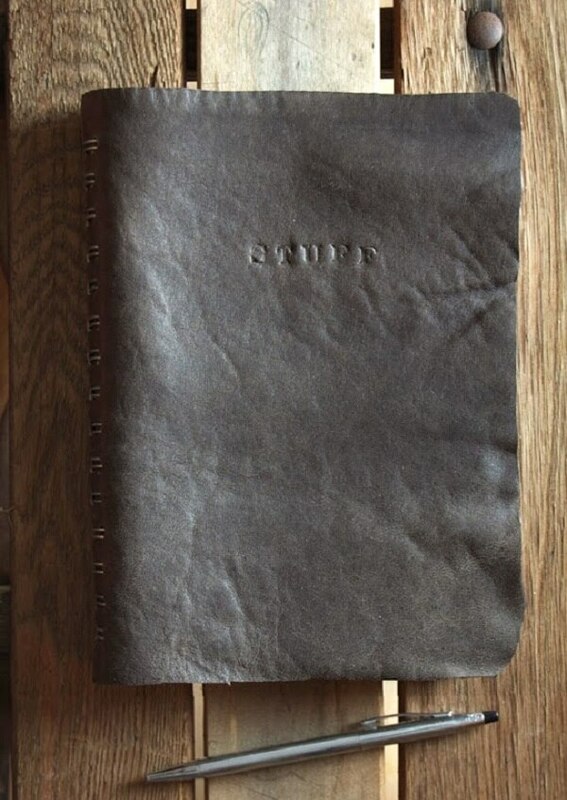 Dress up a boring planner by giving it a leather coat. Use the covers as a pattern to cut out the leather, and punch holes for the spiral binding. 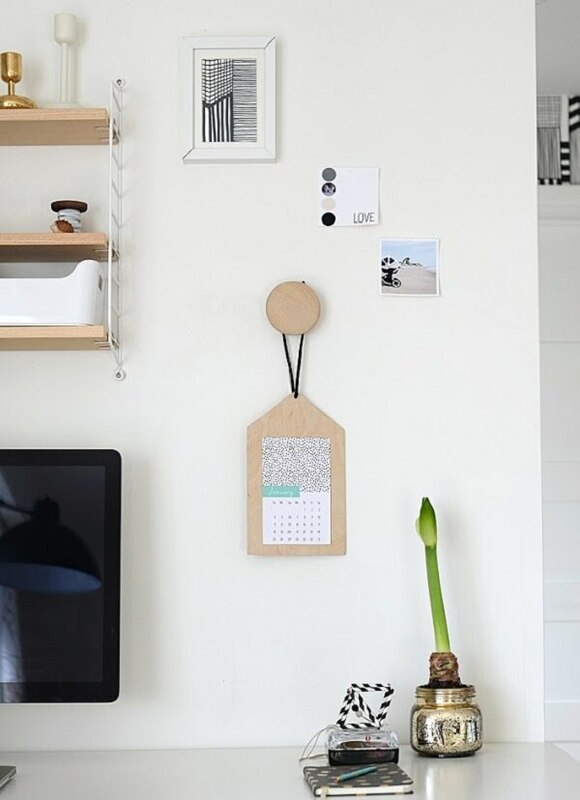 Save on wall (and desk) space with this compact little calendar in a box. Use postcards to delineate the months, and note cards to keep track of each day. If you don’t have a cigar box, you can use a produce carton. 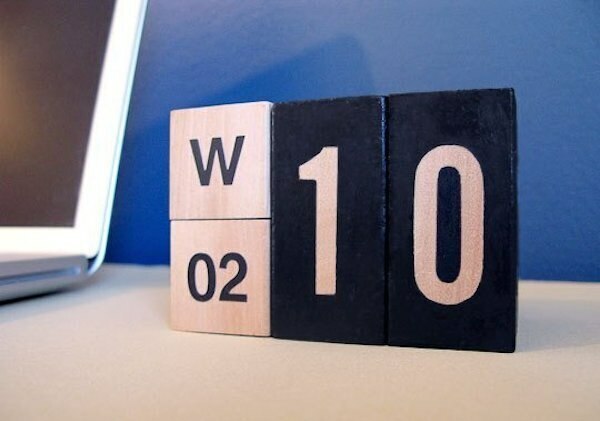 If all you need is a reminder of the date (and you want a super-cool desk accessory to play with), make this minimalist perpetual calendar out of wooden blocks and vinyl letters. 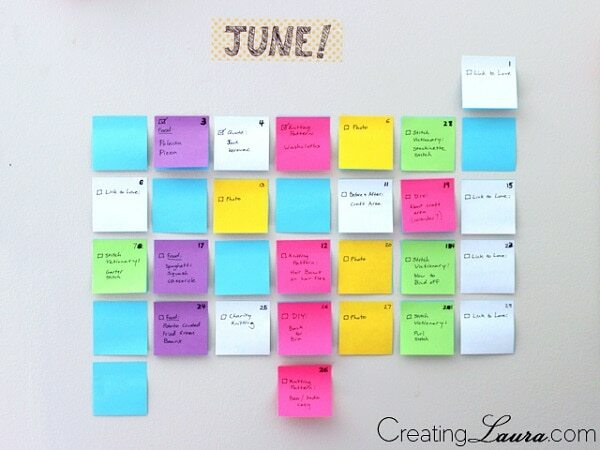 With some strategic cutting and colorful paper you can create a perpetual calendar that will be a permanent and useful fixture on your desk. Keep a bit of nature by your side throughout the year. 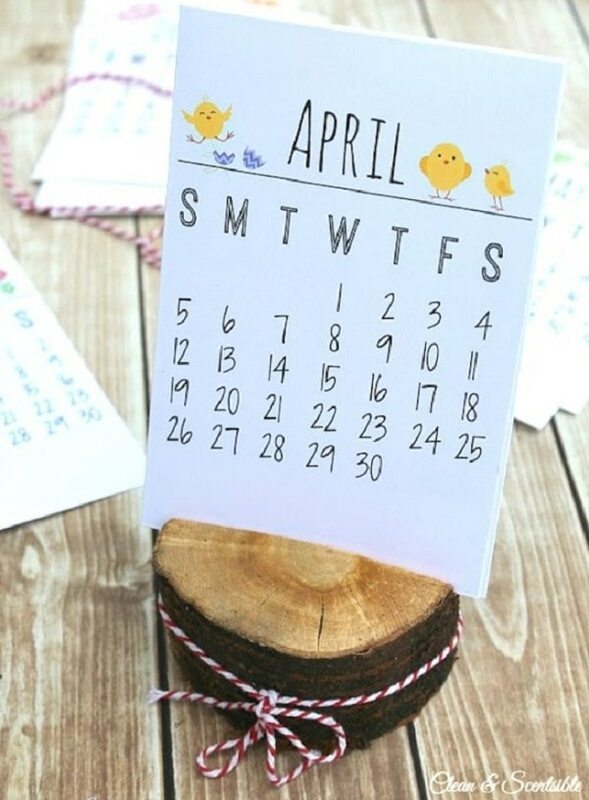 All you need for this charming desk calendar is the free printable and a small tree stump. 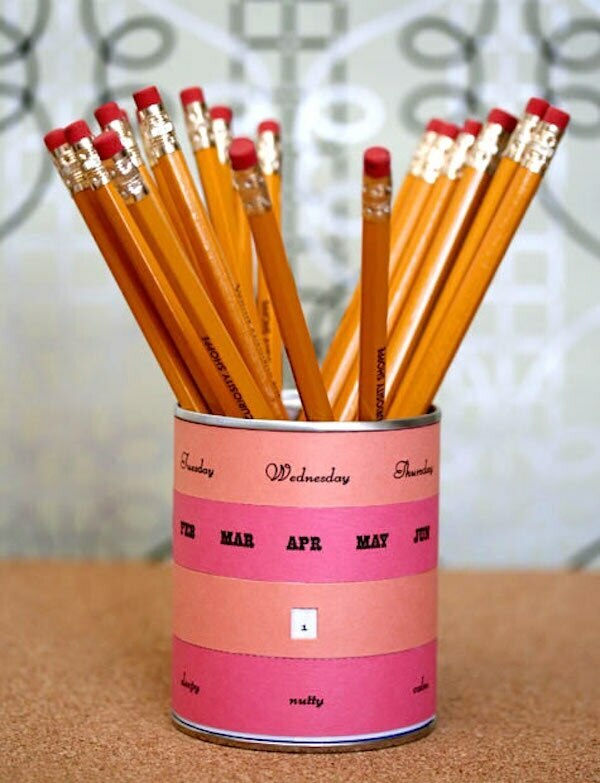 Use an old picture frame to create this weekly planner. You can write directly onto the glass, and easily erase it as your plans change. 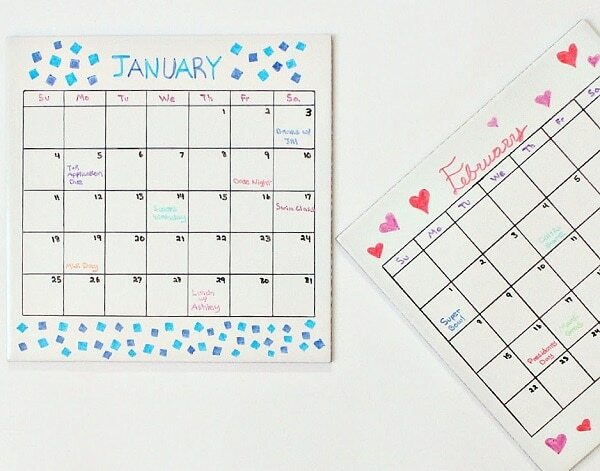 Prettify your walls and desks with these creative DIY planners and calendars that are sure to keep you on track throughout 2015. 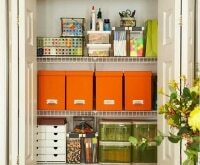 Whether you have an entire afternoon or 10 minutes to spare, it’s easy and fun to get yourself organized this new year. 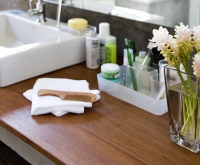 Inexpensive (and free) materials will help you keep your budgeting resolution!